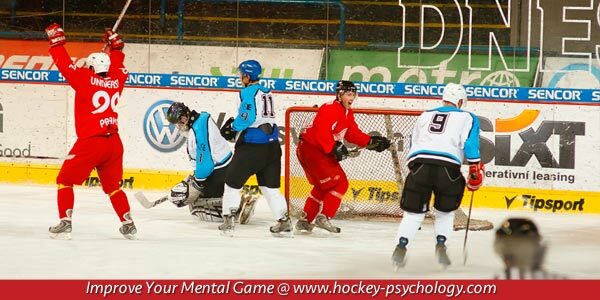 “Play loose,” “stay calm and focused,” and “relax” are expressions utilized by hockey coaches and athletes to emphasize a mindset for peak performance. If everyone knows that playing relaxed leads to peak performance, why is this mental state so difficult to achieve? As a hockey player, you have many things that compete for your attention when performing. When your mind drifts from the present (playing in the moment) to the future (outcomes), you risk making mental errors and not performing your best in games. Hockey players that fear potential outcomes (losing, mistakes, or reduced playing time) become anxious or tense which greatly affects how they physically play the game. Fear initiates a response in the body that causes rapid respiration, inability to focus and increased muscle tension. All of this can lead to making more mental errors than normal. As Carlyle mentioned, the Ducks were tight and couldn’t execute, not able to lead teammates with the pass. We know that muscle tension can adversely affect your performance. As your muscle tension increases, it reduces range of motion, restricts oxygen flow and alters a player’s technique. Try this as an experiment to experience: tense the muscles in your arms and hand and try to putt a golf ball with accuracy. Or tighten your muscles in your arm and shoulders area and attempt to throw a baseball at a target. This tension impedes your body from performing optimally. How can an athlete play loose? Hockey players should understand how tense muscles affect performance. Do tense muscles affect your accuracy or reaction time? Hockey players should be able to recognize when they are playing tense. You need to be able to recognize when you muscles reach a level of tension that negatively affects your performance. Hockey players must be able to manage tension in game situations. You must be able to learn to effectively lessen muscle tension during play. Deep breathing is a quick and effective way to relax during games. Another method for relaxing is by deliberately tensing a muscle then releasing the tension such as “shrugging shoulders which allows your muscle tension to rebound to a baseline level or slightly lower. 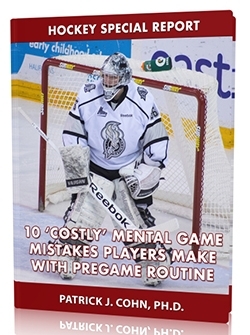 Hockey players need to adopt a process-oriented approach to playing. You need to be able to overcome fear and practice the skill of refocusing on the process or what you need to do in the present moment. You can learn to play relaxed hockey. You can learn to relax during game-time. You can increase your level of play by learning how tension and anxiety affect your play and work on practicing the way you want to play in games.